Buying bagged and prepped food is often convenient but in today’s economy we have to go back to some of the old school ways of managing our home in order to cut expenses. 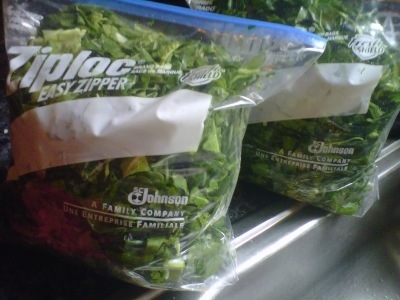 While bagged is great, it’s often more expensive which is why I’m going to show you how simple it is to prep your own bagged collard greens at home. This tutorial will work for kale, turnip or any other kind of green leafy vegetable. First cut off the lower part of the stalks where the leaves end. 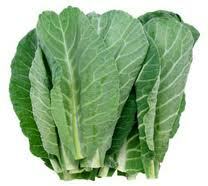 After cutting your collards should look something like the image below. The next thing you want to do is clean your collards. I learned how to (properly ;)) clean collard greens from my husband’s aunt. 1. 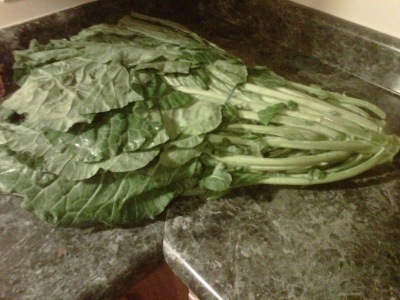 Cut the stem from the bottom of your collards right where the leaves stop. 2. Fill a your sink with cool water. 4. 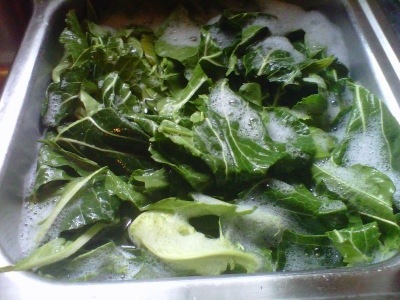 Place all of the collard greens in the soapy water. 5. Using a clean dishcloth, wipe each large leaf and transfer to a large bowl or into your second sink. 6. After wiping each leaf let out your soapy water. 7. Run the soapy leaves under cool water for a few seconds making sure to move the leaves around to rinse soap suds. 8. Refill the sink with fresh cool water and push the leaves under the water. 10. Now you can cut and bag your collards. Bagged collard greens can stay in the fridge for up to seven days. Longer if you have a vacuum seal system. If you’d to keep them longer be sure to blanch them in hot water, cool and then bag. You can store them in the freezer for up to six months.